Many of us are “blessed” with those ubiquitous wood cabinets from (enter name of chain home building supply store here). There is no two ways about it: they are ugly. They are cheap. They serve a purpose. And that’s it. First, fill in any dings or holes on the surface.You’ll need to use some wood putty and a putty knife. Take a small amount of the putty and spread it evenly over the ding. If you’ve never worked with wood putty before, just ask at your local paint shop how to use it. Next, rough up the surface of the cabinet. 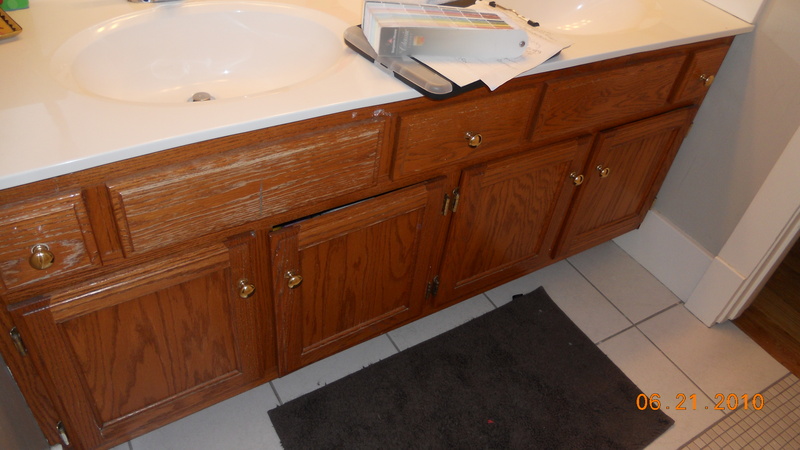 Chances are the cabinet had a varnish applied to it at one time, especially if it is in the bathroom. It may be all but gone now, but you still want to go over the entire cabinet with sandpaper (100 grit is the general choice here) to remove any final remains of a slick surface so that the paint has a good surface to stick to when it’s applied. After you’re done with the sandpaper, go over the entire surface with a clean cloth to remove any dust. Next, prime the surface using an oil-based primer. The primer will offer good adhesion on the wood and under water-based latex paint (the kind you will use here). Next, using a sponge/foam brush or paint brush, apply your water-based latex paint. Brush with even, side-to-side strokes that overlap each other. The trick is to use a light coating of paint: you will need to apply at least two coats, so don’t try to get complete coverage in the first coat. It’s better to have spots and get them in the second (or third) coat than to deal with a drippy mess by coating too much on in the first coat. 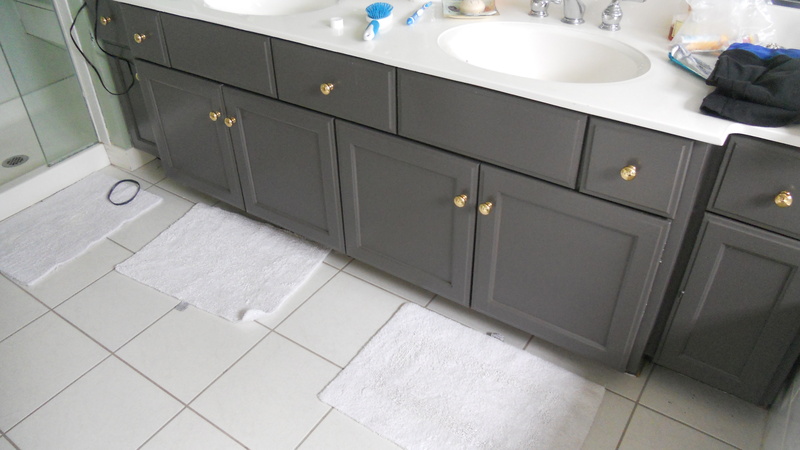 Next, since this piece is in a high traffic area – a bathroom – apply a water-based varnish over the paint once it’s completely dry. The varnish will help protect the paint. Apply the varnish with long, thin strokes. Try to go from one end of the piece to the other. Otherwise your piece will end up looking really streaky. And that’s it! 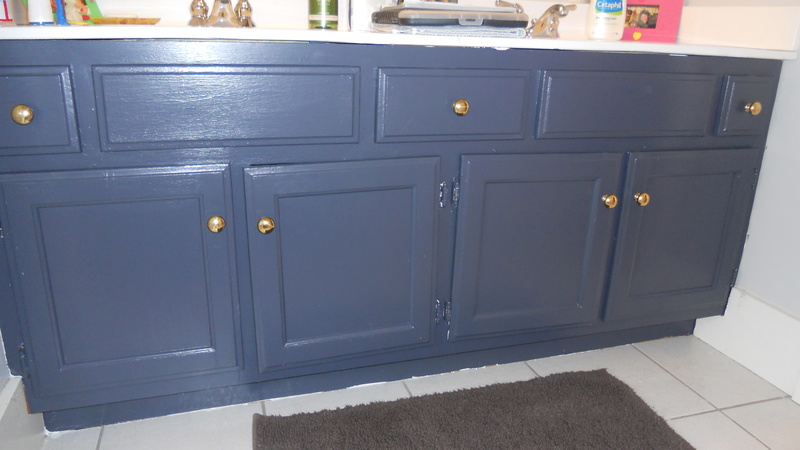 For not a lot of money and a little elbow grease, you can transform the look of that blah cabinet into something interesting. Happy painting!